Originally intended to be a scientific zoo, London Zoo was opened in 1828. However, it was later opened to the general public in 1847. 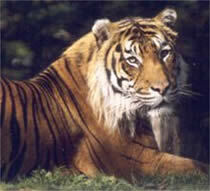 London Zoo is set at the north edge of Regents Park and can be accessed by different means of transport. A total of 755 different species of animals live here with 15104 individual animals. Its main exhibits include the Gorilla Kingdom and the Clore Rainforest Lookout. Not only was London Zoo the first scientific zoo, but it was also the first zoo to introduce a reptile house, aquarium, insect house and children's zoo. Experience Gorilla Kingdom, one of the zoo's major attractions, opened in March 2007 and home to four gorillas and black and white Columbus monkeys. It features an island in the middle of a pond with an indoor gym for the monkeys to enjoy. At certain times of the day you may be given the opportunity to watch the feeding of some animals such as the penguins and the touch paddock in the children's zoo allows children to get up close to the animals.